In January 2016, the WCS Archives began a project to preserve WCS’s historical photographic negatives. Since then, another intern and I have been going through these negatives one by one, inspecting them and creating an inventory, noting any information we can glean about their title, date, and physical condition. To ensure their long-term preservation, these negatives are being rehoused and placed into new acid-free envelopes and boxes. The approximately 50,000 negatives in this collection include both acetate film and glass plate negatives, and the oldest images date back to 1899. During this first phase of the project, I have been working with around the first 10,000 negatives in the collection, which represent the earliest of WCS’s photos, ranging from 1899 to the early 1940s. This project was funded by the New York State Program for the Conservation and Preservation of Library Research Materials. The collection includes photographs featuring a wide variety of different subjects, such as zoo and aquarium exhibits, patrons at the park, zookeepers interacting with various animals, and many series of images featuring zoo and aquarium animals. Among this extensive and varied collection are images related to the work of Raymond Ditmars. 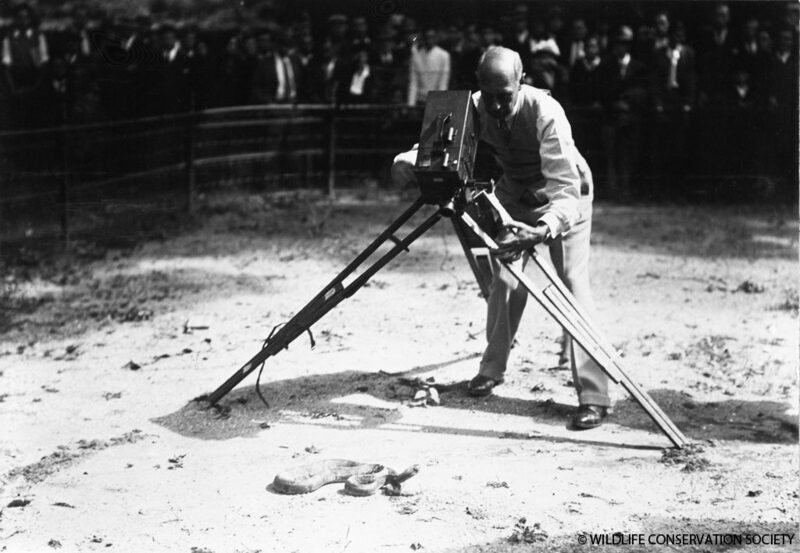 Raymond Lee Ditmars (1876-1942) was a prominent herpetologist who began working with the New York Zoological Society in 1899, four months prior to the opening of the Bronx Zoo (then known as the New York Zoological Park). He was employed as the Assistant Curator in Charge of Reptiles. Snakes and other reptiles from his own personal collection formed the core exhibits of the Reptile House. Ditmars would continue with the Society for the rest of his life, a working relationship that spanned over forty years. Over the course of his career, Ditmars played a major role in running the zoo. By 1926 he was also named the Curator of Mammals, and he continued working extensively with reptiles as well. He was instrumental in bringing new species into the zoo’s collection, and he launched several expeditions to Central and South America to seek tropical specimens for the zoo. Ditmars was also highly interested in both still and motion picture photography. He produced a number of films for the Society, and experimented with a variety of cinematic techniques such as high-speed and slow-motion photography and stop-motion animation. Several of these films can be found in WCS’s film collection, which is currently undergoing similar inspection and inventorying work as the photography collection. 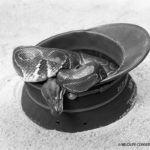 In terms of the photography collection, there are hundreds of images of snakes and lizards that represent Ditmars’s contributions to both the Reptile House and the field of herpetology. 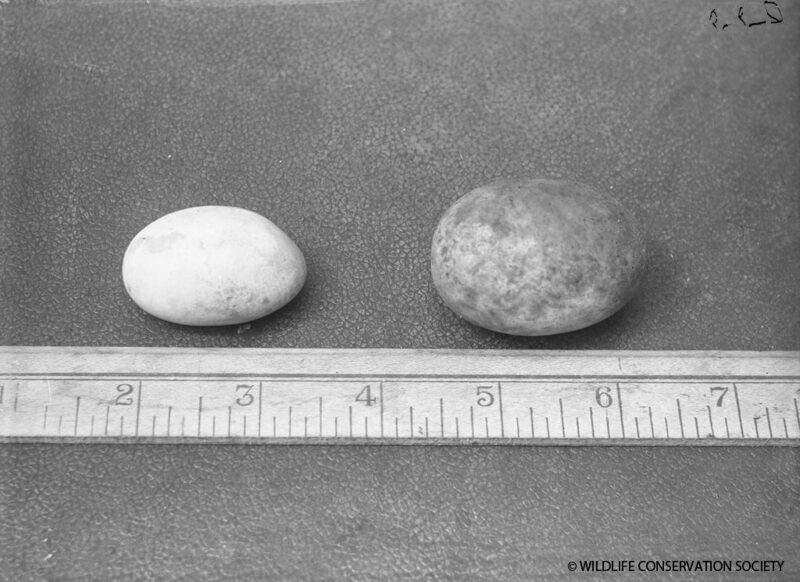 These photographs of scientific and educational importance contain images of the reptiles themselves, as well as snake eggs and zookeepers handling reptiles. 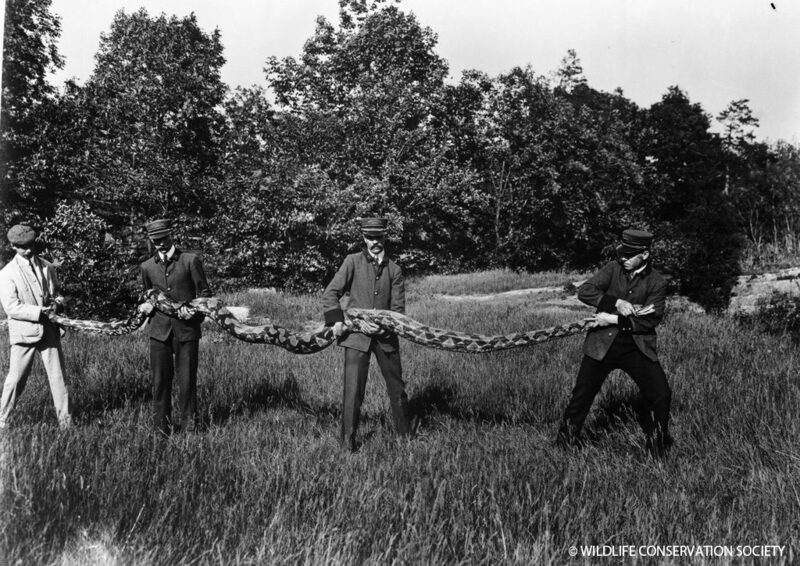 Several images show groups of keepers holding massive pythons, displaying the tremendous size and length of the animal. 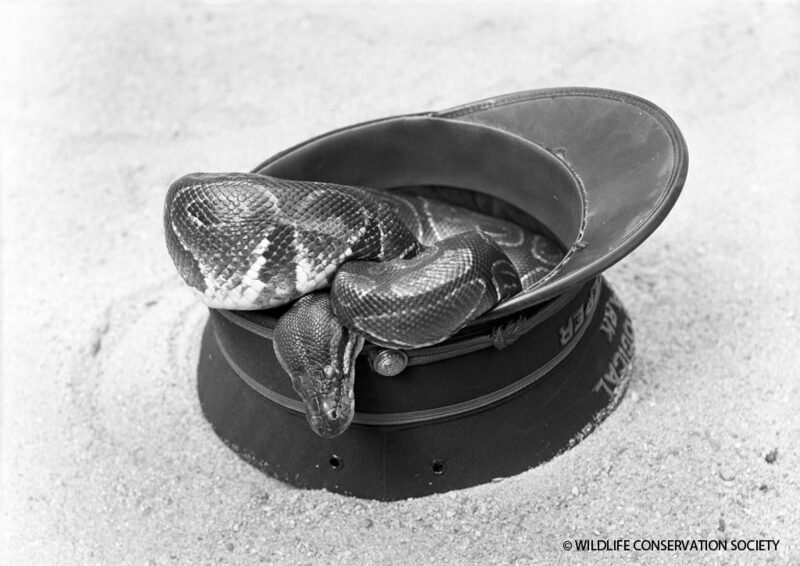 One image even features a very comfortable-looking ball python curled up inside of a keeper’s hat. There are also images in the collection of the Ditmars horned lizard (scientific name Phyrnosoma ditmarsi), a species that was named in honor of Ditmars and his role as a prominent herpetologist who worked hard to educate the public about reptiles. 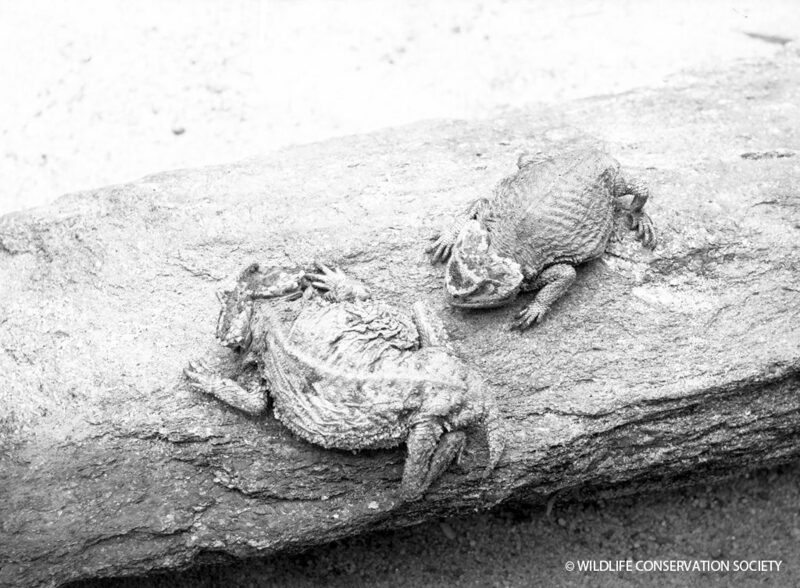 Ditmars horned lizard (Phrynosoma ditmarsi), March 1932. With the continuing work the Wildlife Conservation Society Archives is doing to preserve images like the ones related to Ditmars, they also eventually hope to digitize these images so that they can be made more accessible. This project represents first steps toward achieving this goal and ensuring that such a significant part of history is preserved for the future. This post was written by Savannah Campbell, a student in NYU’s Moving Image Archiving and Preservation program, who interned with the WCS Archives during the Spring 2016 semester. Correspondence from Raymond Ditmars to William Hornaday can be found in WCS Archives Collection 1001. The Archives also holds a small collection of Ditmars’s records; for more information on this, please email us.